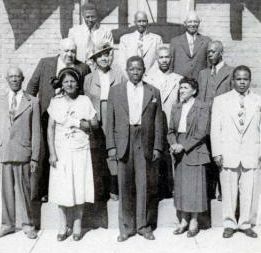 If people thought I was kidding about the point that I've repeatedly made about Black transpeople being integrated into the kente cloth lives of our people, it's time to take a trip back in time to 1951 and the town of Sanford, FL. One of the town's beloved citizens, an African-American woman named Georgia Black has passed away in June. She ran a boarding house, was married twice and had several boyfriends after those relationships ended. Black also raised a son, did domestic work for many of the wealthy families in the town, was a devout church going woman who was the leader of the local Women's Missionary Society and after she passed away was buried at the Burton Cemetery in Sanford. The town's baseball stadium once barred Jackie Robinson from entering it but she is mourned by all who knew her even in this era of virulent Jim Crow segregation. Dr. Orville Barks, the county physician doing the autopsy, is astonished to discover that the frail woman he is examining has male genitalia. Georgia's story was covered in a transphobic, sensationalized manner by the EBONY reporter when he wrote about her in October 1951. I'm going to give it the dignity it deserved. Georgia Cantey was born in South Carolina in 1906 and at age 15, ran away from working on a farm in Galeyville, South Carolina and headed to Charleston. It was while working as a house servant in the city that Cantey began living as a woman. One of the unidentified members of the household staff supplied her with a feminine wardrobe and became her first boyfriend as she honed her feminine gender presentation. Eventually that first relationship soured, and she met in Winter Haven, FL the man that would become her first husband, Alonzo Sabbe. He was quite ill at the time and after Cantey nursed him back to health Sabbe asked her to marry him. Sabbe also had a child named Willie that he had been raising. Willie was the child of Sabbe's cousin who visited Florida and abandoned him when he was three months old. Cantey adopted Willie and raised as her own child after the couple moved to Sanford, FL. Sabbe's health took another negative turn and he died shortly after the marriage, and Cantey got married to Muster Black at the home of Mrs. Joanna Moore, the principal of Sanford's Black elementary school. Unfortunately, seven years after getting married for the second time in her life to Black, the World War I vet died and as his widow, the EBONY story notes she was the beneficiary of his Veteran's Administration pension. .
Georgia continued to live her life until she herself became ill and her story leaked out to the irate disbelief of the Black and White denizens of Sanford, FL. Roy Williams, the police chief of Sanford at the time launched an investigation, but ended it after finding no evidence of criminal activity. Even Dr. Orville Barks was upset about his role in spilling Georgia's gender business. She was not intersex, and Barks caught some flack about the reporting about it from some of the denizens of Sanford. The local paper, the Sanford Herald ceased publishing the story after pastor James Murray of the Trinity Methodist Church phoned the editor and protested about it being placed on the front page. According to the EBONY article, one wealthy person that Black worked for defiantly said," I don't care what Georgia Black was. She nursed members of our family through birth, sickness and death. Sh was one of the best citizens in town." Georgia Black told her story to EBONY a month before her death. She insisted that fate had intended her to be female and dismissed her male genitalia as 'growths'. 'The doctor says he didn't see how I could married, but I don't pay no 'tention to that doctor. My husbands and me had a peaceful, lovely life "
And your life Georgia was a fascinating one that African-descended transpeople following in your footsteps needed to hear about as well. Where Is The Trans Community For CeCe? Please Don't Tell Me, "I'm Color-Blind"! !